Sections of Stampede's 2007 Carnival Presentation, "Come Waltz with Me"
Stampede Carnival Band launched their 2007 Carnival presentation on Saturday 11th November, 2006, at the Kavemar Pub on Henry Street, Port of Spain. The theme of their 2007 presentation, "Come Waltz With Me", centers the costume designs around the waltz dance. The term 'waltz' is derived from the German word 'wälzen' which means to roll, turn, or to glide. This type of dance, which embodies quick and light movements, first became fashionable in Vienna around the 1780s. In fact, some believe that the dance was born in the suburbs of Vienna and in the alpine region of Austria. This dance, which was considered to be highly vulgar and immoral by religious leaders during the 18th and 19th centuries, has grown in popularity over the years and has become commonplace in many formal ceremonies such as weddings. The different sections of Stampede's Carnival Band incorporate many elements of this European heritage and many features associated with the waltz dance. Stampede Mas Band was founded in 2006 by Wrenwrick 'Rennie' Brown who after 20 years in the Carnival arena decided to pursue his dream of producing his own band. That dream is now a reality. Stampede's first presentation "Wings of Spring" proved to be very challenging, but through the very sincere efforts of a number of determined persons including his wife Cynthia, Stampede was truly a force to reckon with. Stampede competed in the Medium Band Category and achieved tremendous success in all six competitions they paraded at. These included: George Bailey Band of the Year - 6th; Saldenah Award - 2nd; Downtown Competition - 4th; Piccidilly Greens - Band of the Year and Lucky Jordan Uptown Competition - Band of the Year. Stampede's 2007 presentation entitled "Come Waltz With Me" was designed by Wrenwrick 'Rennie' Brown and Devon Jerome. The theme depicts the beautiful waltz melodies in ten sections, Roses from the South (a bouquet of roses); Tales of the Vienna Woods (a stroll through the woods); The Blue Danbue (sitting on the river's bank); Emperor's Waltz (a night at the ball); Hungarian Waltz; Champagne Waltz; Vienna Blood Waltz; Voices of Spring; Perpetual Mobile and Ragtime Waltz. The Band Launch, which started close to midnight on Saturday, was observed by family members, friends and supporters of the band. 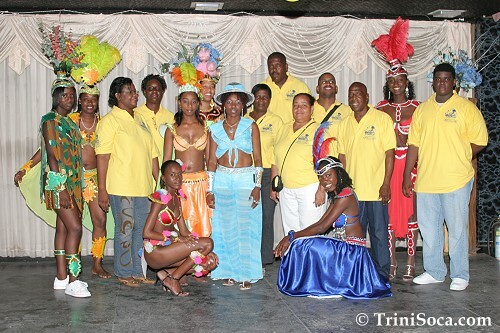 Although the gathering was small, all assembled at the Kavemar Pub watched with enthusiasm as the girls modeled the costumes to the sweet sounds of Kaiso music. After the girls strutted on the dance floor to model their costumes, they took part in a mini 'photo shoot' to further show off their Carnival wear. The team responsible for the artistic costuming was also present dressed in yellow jerseys with their logo - Stampede Raisin' Dust - proudly fixated on them. Band Leader Wrenwrick Brown and his wife Cynthia Brown, who have magnanimously contributed to the band were also present and they, along with some of the committee members, also took part in the photo shoot. They all worked throughout the night to ensure that the Launch ran smoothly and some worked directly with the models to ensure that things were done properly. Carnival, being less than three months away, would be the test that all bands would face to determine their success. Hopefully, especially after witnessing the interesting band sections, the Stampede Band would be successful in 2007. 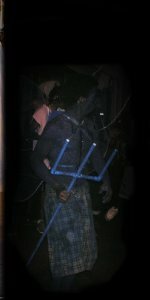 Blue Danbue - This section is an outside section. The Stampede Mas Camp is located at 40 Alberta Street, Woodbrook, Trinidad.